The family is arriving, cars are pulling up and parking. The house is decorated, toasty warm and cheery. In the living room the early football game is on, and many will be popping into the room to ask the in-house sports experts in front of the flat screen for a score update. The household conversations are generally happy and upbeat, and you and all the guests are dressed looking nice to celebrate the holiday. You even remembered the box on the top shelf of the hallway closet that has that crazy cooking apron you got as a gift – and today is the ONLY day of the year that you would even consider making it the centerpiece of your outfit. The kids are excited and playing, the grown-ups are enjoying the afternoon, and the kitchen is sending enticing savory messages that weave their way throughout every room. It is a true American holiday, with the universal theme of giving thanks. When you chip away at all the components that make up this wonderful yearly tradition – it is easy to see that the focus of the day totally revolves around one thing – THE TURKEY! Every cookbook, every online article, and every detailed inclusion on the turkey wrapping plastic – all give the chef of the day specific cooking instructions. The kitchen king or queen has to navigate through the once a year terminology of hens & toms, giblets, temperature ranges and juices running clear. The ultimate desire is to cook the featured bird to total perfection AND at the same time maneuver through expertly preparing the Brussels sprouts, creamed onions, mashed and candied potatoes, biscuits, gravy, stuffing, cranberry sauce, and all the other family culinary favorites. Foil or no foil? Basting or no basting? Stuffed or not stuffed? Aluminum or metal baking pan? Meat thermometer or just seeing if the leg shakes easily? Decisions upon decisions, and then a few more decisions! All about one thing – How to Cook a Turkey! 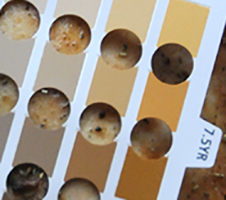 At Munsell we know color, each and every shade and nuance of it! 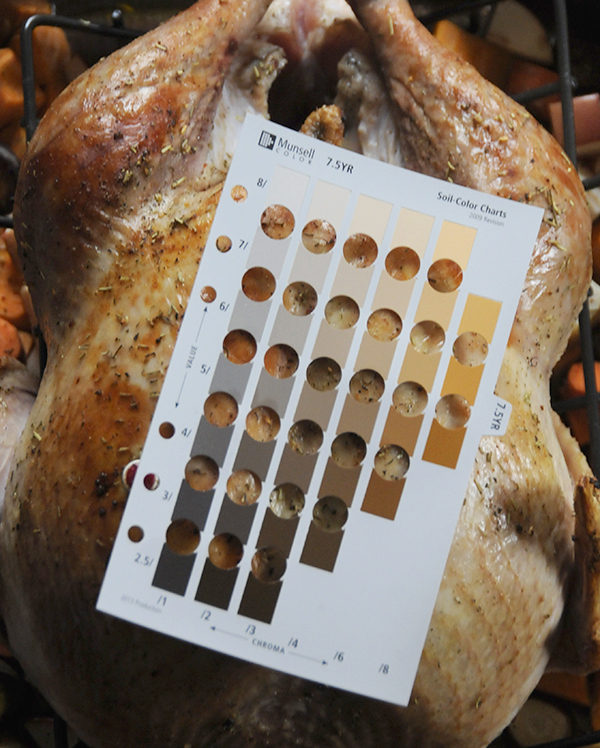 So in anticipation of this year’s Thanksgiving holiday, we painstakingly cooked, and documented every shade of turkey using the Soil Color Chart – so that you can view the progression as it relates to our color system. The Munsell color tools are the way professionals talk and communicate color. From interior design to Government standards to product development – every industry uses our system. Developed for the way humans actually see and process color, Munsell pinpoints every color imaginable. 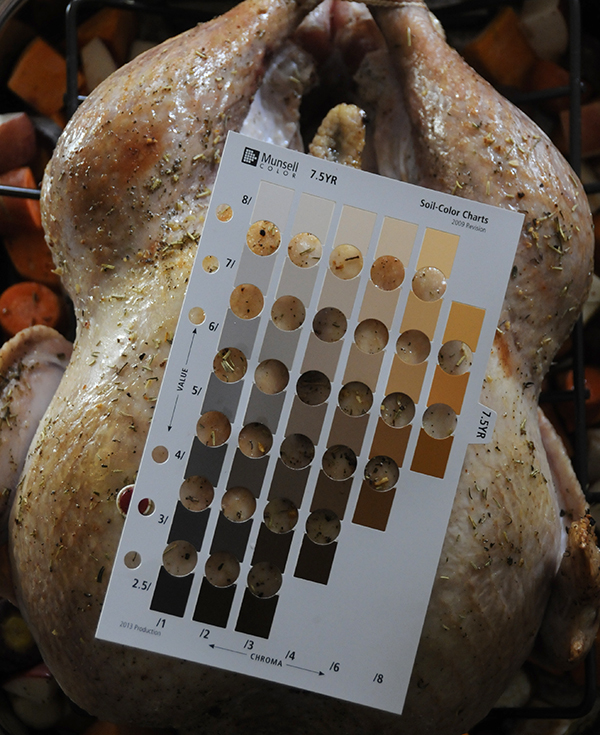 So there is certainly the identical Munsell color match for every subtle shade your turkey exhibits over the 5 or 6 hours it spends baking in the oven. It is that first impression when it first comes out of the oven and everyone is looking for that gorgeous brown color that acts as the wrapping for the meal. Enjoy a little bit of fun with color this Thanksgiving as we have documented the color journey that you will experience from ‘store package’ to ‘Thanksgiving table’. 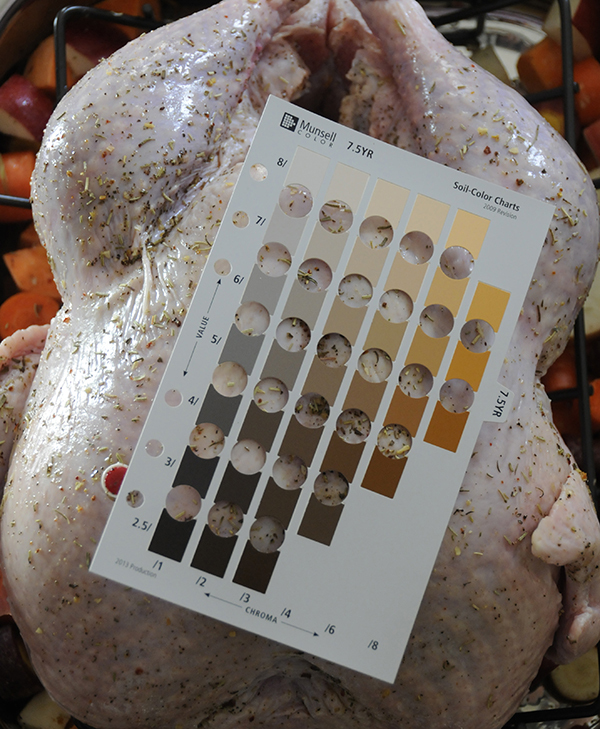 When your turkey’s color matches our perfectly done Munsell color shade – as the definitive test – remember to take its temperature and make sure the targeted safe eating range was attained – 165 degrees for both the dark meat AND the in-the-bird stuffing! One last item: just as anything else in life, variety is the ultimate spice. 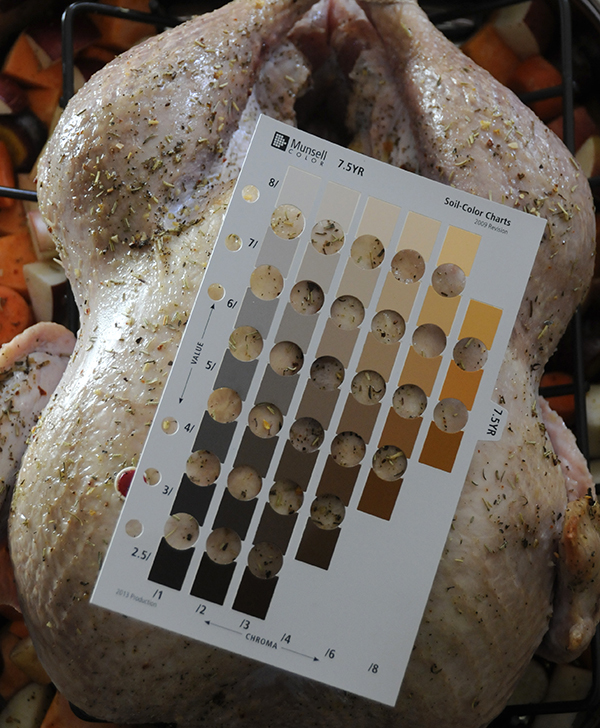 Let us know what your favorite Munsell Notation is for skin color on that perfectly cooked turkey before it is properly dismantled. 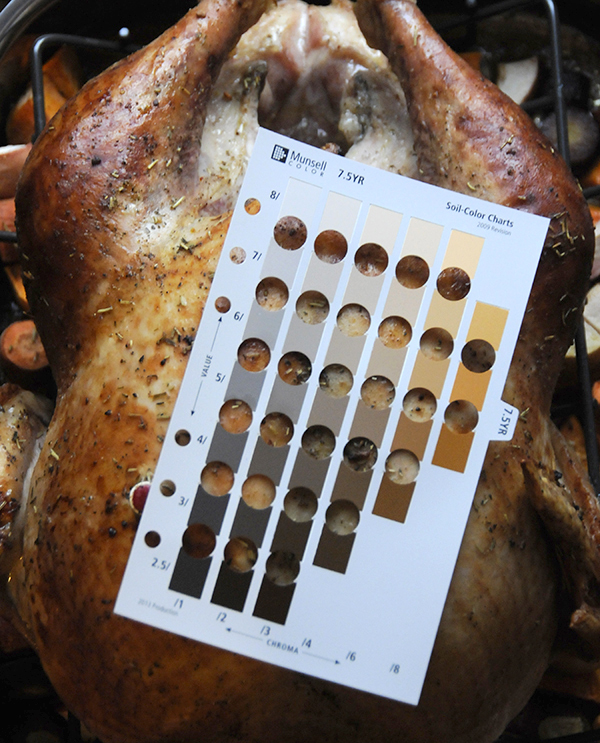 And for our friends that may not partake in the turkey, let us know what the Munsell Notation or color is for your favorite Thanksgiving dish.